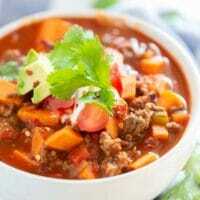 This chili is loaded with veggies but the real star of the show is the addition of sweet potatoes. Let me tell you, it’s a game changer. For more amazing chili recipes, make sure you try our old fashioned chili and our chili cheese fries. You can also make this chili in a crockpot. When I hear the word hearty, I have an instant picture of a steaming bowl of chili pop into my head. I know I can’t be the only one. It warms the tummy and the soul. 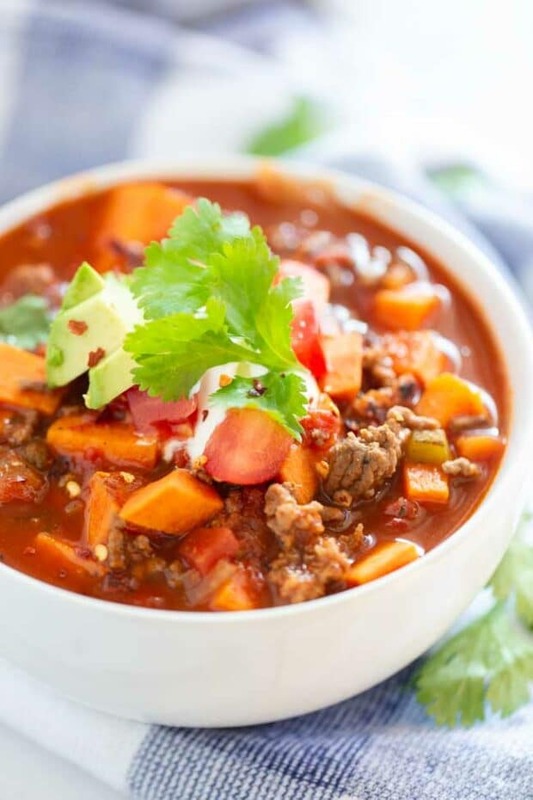 As with any chili, when it comes to sweet potato chili, you can choose to follow the ingredients list exactly, or leave some out — or throw in any extra veggies you might have around the house! 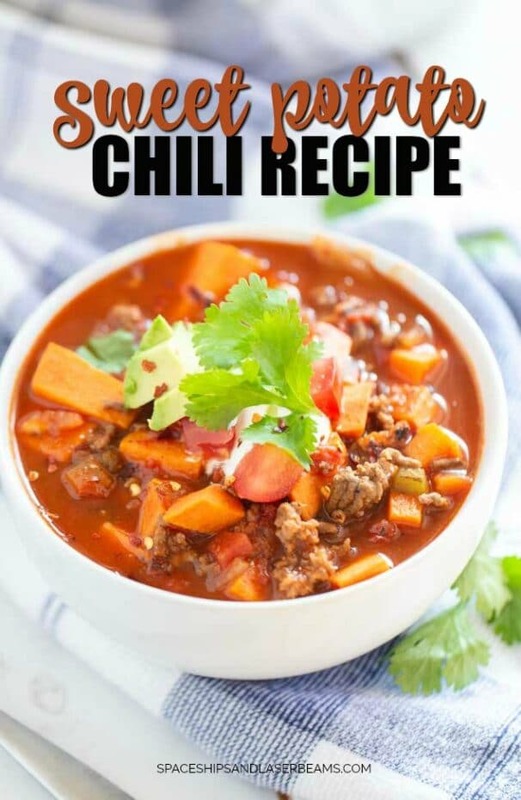 The beauty of chili, is that you can get creative with it. I also like to add ground beef to my chili recipes, but it could easily be left out of this one to make it a vegetarian chili. From there, I just start adding in veggies. In addition to sweet potato, I like to add onion, peppers, garlic, tomatoes, and anything else I might have laying around the house at the time. When finished cooking, drain the grease from the meat and onion mixture and set it aside in a separate bowl. In a separate hot pan, add in the sweet potatoes, bell pepper, and cloves of garlic and cook them together. 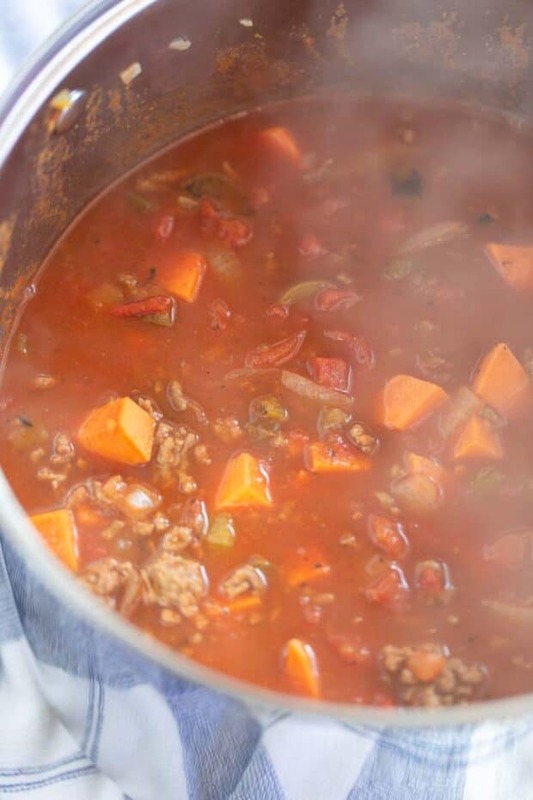 If you plan on simmering for longer than 30 minutes, you may leave the vegetables slightly undercooked. But, if you plan to do a quicker simmer, cook the veggies until they are fork tender. Once cooked to your desired tenderness, add in the meat and onion mixture, tomatoes and chili, tomato sauce, and vegetable broth. Then, mix in the bay leaves, cumin, chili powder, and red pepper flakes. After all of these ingredients have been added, bring chili to a boil. The final cooking step is to let the chili simmer. The amount of time you let it simmer will depend upon how soft you cooked the vegetables. If you left them a bit undercooked, then you’ll require a longer simmer time. If you cooked the veggies completely, you can do a shorter simmer time. Typically I allow my chili to simmer anywhere between 15-60 minutes. Once finished simmering, stir in the cheese one handful at a time until completely incorporated in the mix. If desired, top the chili with sour cream, fresh tomatoes, and cilantro. One of my favorite parts about serving chili, is the endless options for what to serve with it. Of course, I always like to serve sour cream, cheese, fresh tomatoes and cilantro as an option for garnishes. This chili also tastes great with a crunchy garnish such as tortilla chips, because the black beans give it a Mexican flavor. The chips are a nice contrast and add a little crunch. My go to side is homemade cornbread. I also love dinner rolls or our delicious beer bread with this chili. There’s nothing better than dunking a warm delicious piece of bread into your chili. You can never go wrong with chili. It’s hearty, filling, and delicious. It’s always fun to try out new chili recipes and get creative mixing new things into the mix. 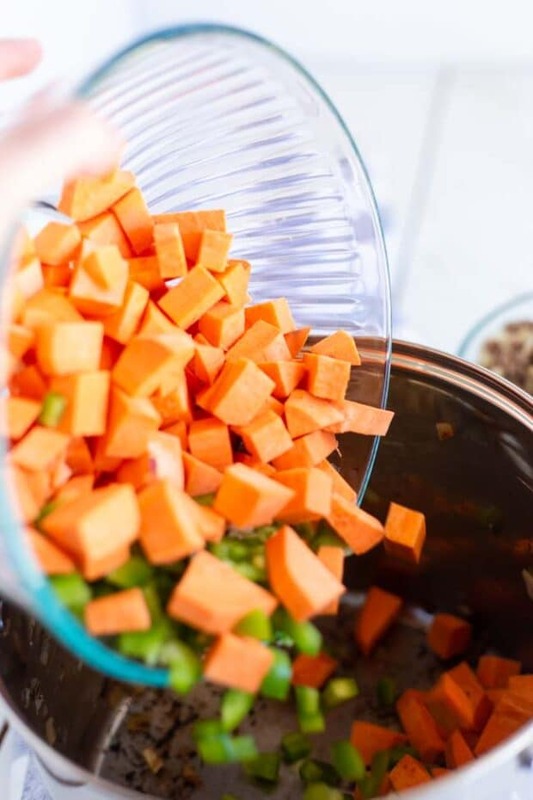 Adding sweet potatoes and black beans into the same chili mix was a game changer for me, and I have no doubt it will be for you, too. Chili Mac and Cheese <- Reader Favorite! Hearty and flavorful, this sweet potato chili is a family favorite! Place the pot on the stove and turn heat to medium-high. Cook ground beef and onion until fully cooked. The onion should be translucent and the ground beef should have no pink in the center. Drain the grease from meat and onion mixture and set aside in a separate bowl. Add sweet potatoes, bell pepper, and cloves to the hot pan and cook. If you plan on simmering for longer than 30 minutes, you may leave the vegetables slightly undercooked. If you plan to do a quicker simmer, cook until fork tender. Once cooked to desired tenderness, add in meat and onion mixture, tomatoes and chili, tomato sauce and vegetable broth. Mix in bay leaves, cumin, chili powder, and red pepper flakes. Bring chili to a boil. Once boiling, turn heat down to medium-low and simmer. Simmer for 15-60 minutes. Once finished simmering, stir in cheese, one handful at a time until completely incorporated. Top chili with sour cream, fresh tomatoes, and cilantro. 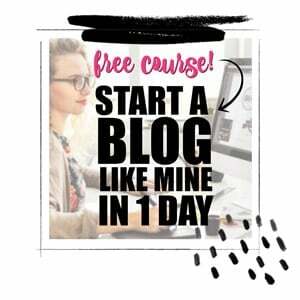 Yum – I’ve never had this variation with sweet potatoes… I can’t wait to try! It looks delicious!